The RHS Shakespeare Festival took place March 24 and 25 in the cafeteria, and was a complete and total success. Several groups of students came together, and gave the audience a night filled with compelling performances of Shakespeare’s works. With classics like Romeo and Juliet, the cast portrayed a beautiful story of love and rivalry while the ensemble of Hamlet depicted the tale of a man gone mad. The cast of Macbeth brought forward a story of murder and madness, while the actors of A Midsummer Night’s Dream had the entire audience rolling in the aisles. From the talented actors to the brilliant sonneteers, the entire night was filled with beautiful words and exciting stories. 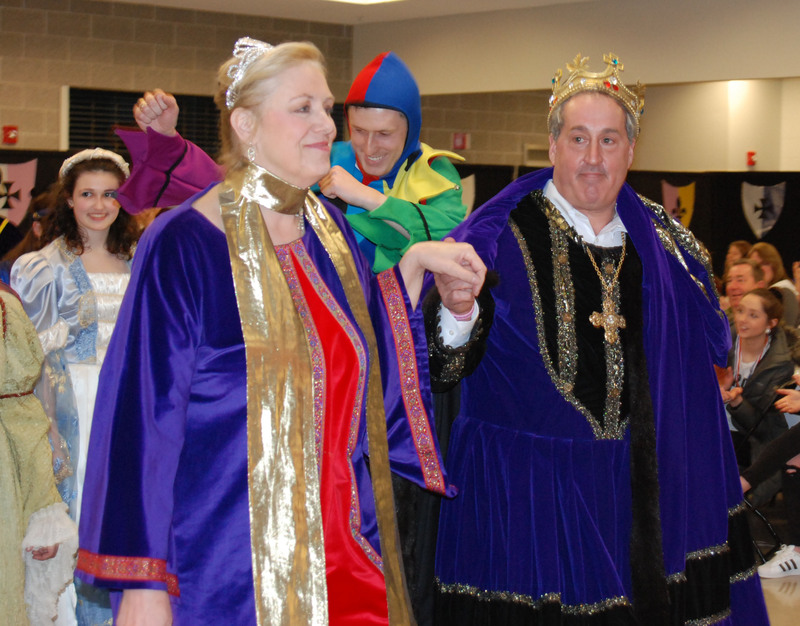 With the roles of the King and Queen played by athletic director Gary Graziano and English teacher Susan Patton, both nights were filled with joy, and on Saturday night a delicious stew made by the King himself. Faculty members, Adrienne Donovan, Shelley Coulombe, and Freea Leahy served the food and managed the kitchen during the performance. Three witches, played by teachers Joanne White, Melissa Shaughnessy, and Jill Fagan, conjured up the night of theatre, while the jester, French teacher Patrick Finn, conjured laughter with his assistant Mark Shields. The gypsies, played by art teachers, Cheryl Thompson and Kata Medeiros, stole the show along with many unattended valuables. A grand total of 32 actors and nine crew members, made up the cast along with the many students and teachers who helped make the night go smoothly. The entire English department was involved in the creation of the night in their roles as directors. Kendra Donovan directed Ronan McNally in the emotional and famous “To be or not to be” scene. Mr. Neal and Mr. Bigsby teamed up to bring the mayhem and madness of Macbeth to fruition. Ms. Walsh directed her cast’s knee-slapping humor with their hilarious take of A Midsummer Night’s Dream, and Ms. Cahill directed Jurnee Dunn’s poignant performance as Juliet. The night took three months to plan and it was obvious that every second was worth it. The hero of the night was English teacher Kristen Walsh, who was the overall director and made the performances possible. “It was an amazing two nights. The talent we have here, both dramatic and comedic, was really impressive,” says Ms. Walsh. Everyone was pleased with how both nights played out and many left with a new love of Shakespeare. To see more photos go to our photo gallery menu. For theatre scene photos go here. For Friday night’s photos go here. For Saturday’s show, go here.